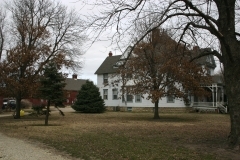 The Warkentin Farm in Halstead was developed by Bernhard Warkentin between 1874 and 1908. The farmhouse was designed by well-known Kansas architect John G. Haskell. This property is significant for its advances in agriculture made on the site and for its reflection of German Russian ethnic heritage. 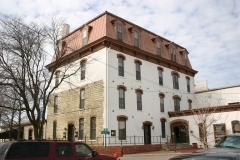 The property symbolizes an important era in the life and career of Warkentin, who is nationally significant for promoting German Russian Mennonite immigration to the central Great Plains region of the United States. This involvement reflects important trends in the settlement of the Kansas and the American West. Additionally, Warkentin revolutionized the American grain economy through his work with Russian and Turkish Wheat, as well as, American-European wheat hybrids. 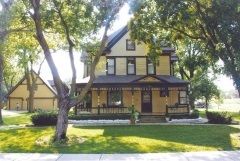 The history of the Wirkler-Krehbiel House is intertwined with that of Bethel College located across the street. Christian and Elizabeth Wirkler were charter members of Bethel College, which formed in 1887 and opened its doors in 1893. 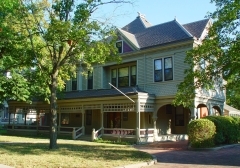 Wirkler erected the Queen Anne-style residence in 1898, and he served the college by housing student boarders. It was later home to Wirkler's daughter Mary and her husband C. E. Krehbiel, an important local figure in early 20th century Mennonite circles and whose father had played a key role in the Mennonite settlement in the area. Bethel College acquired the home in 1958 and sold it in 1992 for use as a private residence. The house was built toward the end of the period during which the Queen Anne style was popular. The stylistic features include its irregular form, asymmetry, fishscale shingles, turned spindles on the porch and balustrade. It is nominated for its local significance in the areas of education and architecture.